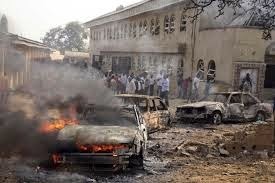 There was a failed New Year Day suicide bombing attempt in Gombe, the Gombe State capital, yesterday. It came less than 12 hours after two suspected bombers were killed by their bombs in an attempt on the Army Barracks in the town Wednesday night. Yesterday’s attempt was at the ECWA Church III behind Gombe State University. The bomber was killed by his bomb before he could cause the havoc. The Boys Brigade members guarding the church saved what would have been a disastrous New Year celebration. According to one of the members, the suicide bomber arrived on a motorcycle and tried to break the barricade. He said the bomber was asked to alight to be checked but he declined. The Boko Haram suspect then tried to meander through the barricade but the explosive he had on blew up and killed him instantly. Five Boys Brigade boys were slightly injured. Another one with serious injuries almost had one of his arms chopped off. At the Army Barracks on Wednesday, an eyewitness said soldiers on guard were searching a vehicle when a motorcycle arrived with the passenger carrying a bag. The entire place was immediately cordoned off and those trapped within the Mami Market were released about two hours later after a thorough screening. The two men on the motorcycle died immediately. Gombe police spokesman Fwaje Atajiri, declined to speak on the barracks incident. On the church incident, he said: “He came with a motorcycle and tried to enter the place but as a result of the security measures put in place, he was blocked and the bomb exploded instantly and he was killed”. He said the deceased bomber did not look like a Nigerian, judging by his facial marks. Atajiri urged residents to always report suspicious individuals and movements. An eye witness, Malam Aminu Muhammad, whose house is close to the blast scene, told NAN that he was indoors when he heard a loud sound. “When I heard the sound, I immediately came out, and what I saw was horrible. “I just saw human parts scattered everywhere, with blood and pieces of motorcycle which the suicide bomber rode on,” Muhammad said. Malam Abdullahi Isah, the Secretary, Gombe Specialist Hospital, said 10 injured persons were brought to the hospital. According to him, the victims sustained various injuries and were undergoing treatment. One of them was taken to the theatre, Isah said.